Javeria Abbasi was born in Karachi Sind, Pakistan. Javeria Abbasi is one of the most beautiful, hot and bold actress and model in Pakistan Showbiz Industry. Born to a middle class family Juvaria’s father, a notable writer and her mother, hailing from a family of traditional herbal pharmacists (hakims), she was brought up in the metropolis of Karachi where she later went to college. Javeria Abbasi is the new face of bridal makeover shoot for wedding. 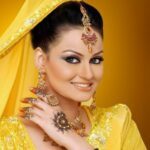 Here we are going to share her very pretty and stunning Bridal Hairstyle, Bridal Makeup, Bridal Jewelry and Bridal Mehndi shoot in this collection. Javeria Abbasi Bridal Makeover shoot are looking impressive.